BRUSSELS (AP) Ugly scenes marred the end of Spain’s surprising loss to Belgium by 18-10 in Brussels on Sunday as Spain players blamed the Romanian referee for their team’s failure to automatically qualify for the 2019 Rugby World Cup. 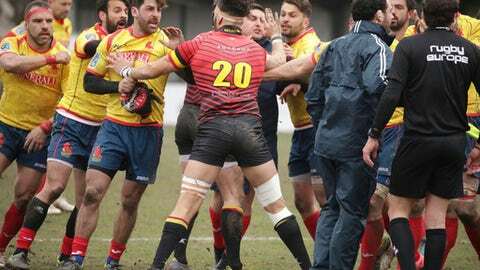 Spain would have qualified for the first time in 20 years with a win but defeat meant Romania advanced through the Rugby Europe Championship, which doubled as European qualifying, to the Rugby World Cup in Japan. Belgium led 12-0 at halftime from four penalty kicks and 15-0 soon after from another penalty. Spain closed within five with six minutes to go, but a sixth penalty kick by Belgium in the 76th minute ended the Spaniards’ hopes. Spain said the penalty count was 18-8 in favor of Belgium. ”The referee canceled us,” captain Jaime Nava said. At fulltime, Spain players angrily confronted referee Vlad Iordaschescu along with his two fellow Romanian assistant refs. Iordaschescu had to be escorted from the field by security. Spain was in pole position for qualifying after it beat Romania 22-10 in Madrid last month for the first time in six years. FER said the next day it asked the president of the Rugby Europe referees commission, Patrick Roben, to change the officials for the Belgium match because all three were Romanian, and Romania needed a Spain loss to qualify. FER said Roben denied the request because the match appointments were done weeks in advance. Only the match commissioner was changed, to a Frenchman. Rugby Europe released a statement on Sunday confirming the appointments were made before the Rugby Europe Championship, and confirmed during the tournament based on refs’ performances. On Sunday, Romania lost its Rugby Europe Championship title to Georgia 25-16 in Tbilisi. But the Oaks finished second in the standings to qualify for the Rugby World Cup, a point above Spain. Georgia already automatically qualified. Romania will slot into Pool A with Ireland, Scotland, Japan, and a yet-to-be-determined playoff winner. They are scheduled to play the opening match with host Japan at Toyota on Sept. 20, 2019. Romania has played at every Rugby World Cup but never advanced beyond the pool stage. Spain, which last made the Rugby World Cup in 1999, has a harder road to qualify. It will play Portugal for the right to play Samoa home and away. The winner on aggregate will join Romania in Pool A as the playoff winner, and the loser will go to a four-team repechage in November with Canada and two other teams.